At Asian Institute of Healing Arts, we utilize whole food supplements and herbal preparations to affect the biochemical balance of the body. With nerve supply intact and meridian energy flowing, the organs and tissues of the body can still need the basic biochemical building blocks to rejuvenate the cells. The doctors at Asian Institute of Healing Arts have been studying and utilizing a whole food supplement company called Standard Process since 1988. Standard Process was established in 1929 by a doctor named Royal Lee. His particular genius was recognizing that the body is designed to use and break down foods as a nutritional source. His main area of study was the process of condensing the nutritional essence of foods and delivering these concentrated foods to patients that needed them. To this day, his company maintains over 1000 acres of farmland where the ingredients for many of his formulations are organically grown. This strict control from plant to product ensures that Lee’s “standards” are consistently met. The fundamental premise of Lee’s work focuses on the complex biochemical interplay of nutrients, their cofactors, and synergists that make them effective. He recognized that most “nutrients” sold over-the-counter in health food stores and health care facilities are in fact isolated, fractionated chemical components which do not react within the body in the same manner as whole natural compounds. When the “active ingredient” is chemically isolated, refined and purified, it becomes more like a drug than a nutrient. It is a chemical, not a food. These “nutrients” are manufactured by drug and chemical makers using sugars, acids, petroleum distillates and a wide variety of substances that could hardly be classified as nutrients. The use of these isolated chemical components over the long term tends to promote nutritional imbalances. By supplying only a fraction of the nutritional compound, the body is called upon to complete the complex by depleting any stores it may have built up. The resulting imbalances can be more detrimental to the body’s biochemistry than deficiencies. In addition, the breaking down of chemicals is more stressful than processing foods. That additional stress further challenges the body’s detoxifying and immune systems depleting its ability to maintain health. 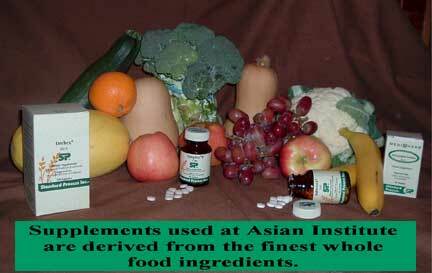 At Asian Institute of Healing Arts, a variety of diagnostic strategies are employed. It starts with a detailed and careful case history. This history is a verbal record of the origin of the particular problem. This history is reinforced by a health survey. This written tool is a broad ranging health questionnaire that focuses on the different symptoms that each patient presents. Through the use of the case history and symptom survey, a picture of the patient’s health is developed. From there, to further clarify or refine the health picture, the doctors of Asian Institute may employ testing that reveals weaknesses in the body. These methods are drawn from disciplines such as Applied Kinesiology, Contact Reflex Analysis, Autonomic Response Technique and others. These systems utilize points from acupuncture and other reflex points to assess the energetic biochemical balance of the body. Information derived from these procedures is then compared to what was uncovered in the clinical impressions following the case history and review of the symptom survey. All this information is considered and correlated to determine any nutritional recommendations. Even the most brilliant biochemist cannot improve on the balance that nature designed. At Asian Institute, through the use of Standard Process, we are giving the body the food that nature made to rebuild and/or maintain health. What could be more natural than that?